The biggest play of the drive (and quite possibly the game) was the fake punt on play five on 4th-and-2 from the Chargers own 28-yard line. With a punt, the Chargers would initiate sudden death, giving the Chiefs a 59% chance of winning the game. 4th-and-2 converts roughly 57% of the time on fakes. 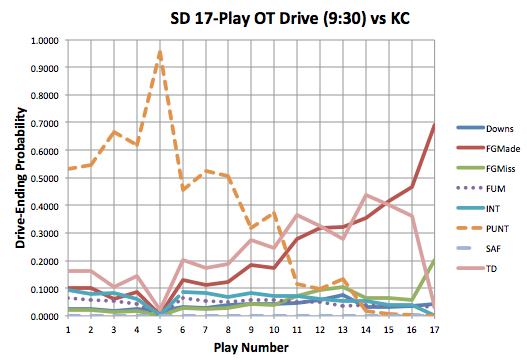 If the Chargers fail, they initiate sudden death and the Chiefs would win 83% of the time. With a successful conversion, the Chargers would be looking at about a 56% chance of winning. Based on league-average expectation, E[WP Fake] = 56% * 57% + 17% * 43% = 39% < E[WP Punt]. So, just looking at the raw numbers, punting is very slightly the better option. Let's look at some of the local factors that would affect these probabilities, though. Despite winning for the majority of the game, Kansas City had their backups in the entire game - and San Diego was heavily favored. In addition, the Chargers have the No. 3 and No. 29 opponent-adjusted offense and defense in the league respectively. Both of these factors would sway the probabilities toward going for it (as it would increase the Chargers chances of converting and winning on a conversion, and decrease their chances of stopping the Chiefs on a failure or punt). Last, as we mentioned before, the Chargers could play for the tie. That means we really cannot just use the complements to calculate expectation, since tie probability is significantly non-zero. A conversion would greatly increase the chances of a tie in this case. Again, this is using league-averages so we would assume that would tilt the scales further toward the Chargers. There is no doubt that Mike McCoy would have been killed in the media had the fake failed. Ultimately, while certainly a high risk decision, the data at the very worst supports the decision as a near coin flip. The play wasn't "called," it was an audible. Also, even though everyone says it was 4th and 2, it looks to be 4th and 3 in actuality. I know the blue line is unofficial, but it sure looks like the ball is on the 27, not the 28. That chart needs more explanation. How is there any reasonable chance of a punt ending a drive on the 1st, 2nd, or 3rd play?